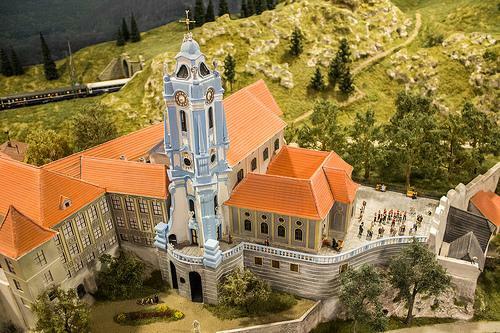 Miniversum has 1:100 scaled, intricately detailed model layouts of major sights and landmarks from Budapest and Hungary, as well as few from Austria and Germany. Miniversum has 1:100 scaled, intricately detailed model layouts of major sights and landmarks from Budapest and Hungary, as well as few from Austria and Germany. The elaborate landscapes comprise 600 buildings, 5000 miniature figures, 5000 trees, and 1000 cars, complete with sound and light effects. The railway tracks have a total length of 1.3 km, on which 100 trains run. The interactive screens show original photos of the sights on the layout. The various actions and effects are controlled and monitored from a dashboard in which visitors can also participate.